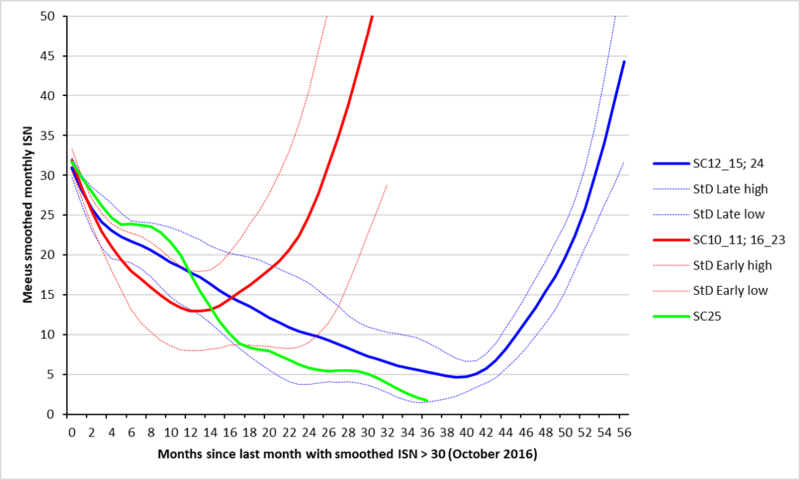 During the summer of 2011, SSN increased, reaching a smoothed value of 98,0 in November. 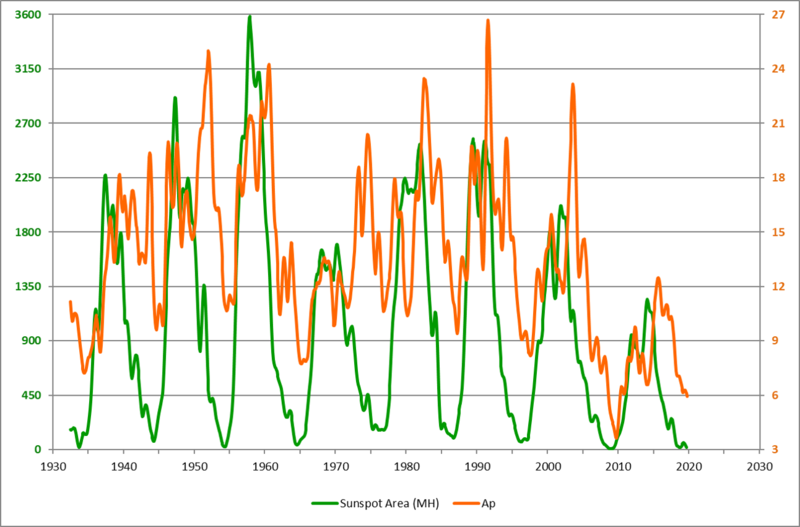 Since then, sunspot activity decreased until a minimum was reached in December 2012 (83,2). 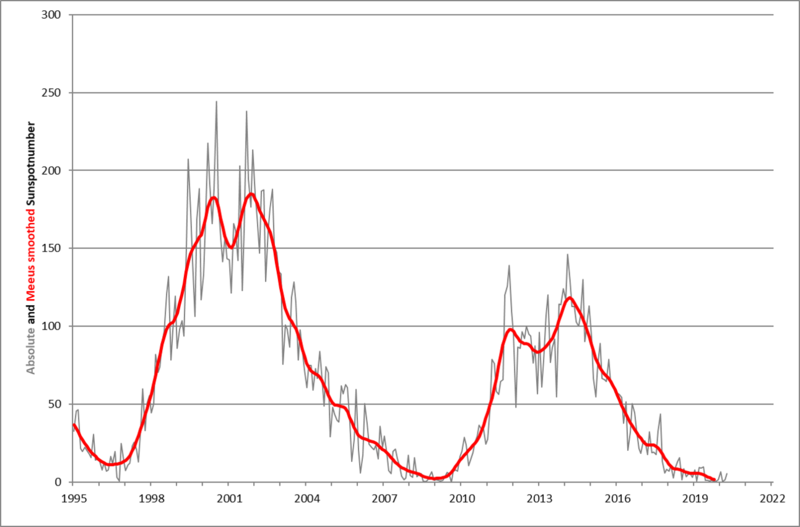 A new smoothed maximum was reached in March 2014 (118,2) and is probably the true maximum for this solar cycle. Slightly different values can be obtained pending the used smoothing formula. This smoothed value was within the error margins of the predicted SC24-maximum by ISES/SWPC panel (90 +/-20 in the old version of ISN; est. 135 +/-35 in the new version). 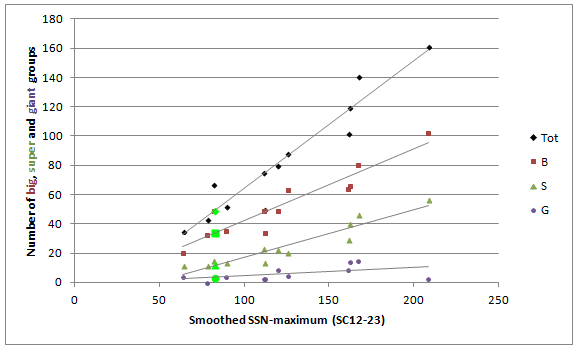 See also this little article I wrote for the STCE Newsletter (10 November 2012): Has SC24-maximum passed?, as well as some comments by F. Clette from the SIDC/SILSO. The polar field reversal seems to have taken place on the Sun's north pole (early 2013), and seems to have been completed on the south pole mid-2014. In 2015-2016, the south polar magnetic field was stronger than the north one, but in 2017, the field strengths were similar to each other. (see Wilcox SO and MSFC). This evolution has also been recorded in the polar faculae counts over the last few months, i.e. since early 2015 (see Polar Faculae). A comparison of the rising and maximum phase of SC24 with previous solar cycles can be found here (ISN v1.0). Possibly the first sunspot group of SC25 was observed on 20 December 2016. See this STCE Newsitem. Another possible SC25 sunspot group (NOAA 12694) was observed early in January 2018. It had the right latitude, but not the reversed magnetic polarity (similar to SC24 spots!). See this STCE Newsitem for more info. Throughout 2018, quite a few small and short-lived but unnumbered SC25 sunspot groups appeared (See e.g. this and this STCE Newsitem). The evolution of the smoothed sunspot number can be followed here as SC24 declines towards its minimum and new SC25 will increase the sunspot activity again. The SC24-25 transit can be compared to previous solar cycles, which have been conveniently grouped into two bins: cycles 12-15 & 24 (blue curves), and cycles 10-11 & 16-23 (red curves). The dashed curves indicate the standard deviation from the average curve (thick lines). Point "0" is the last month with a smoothed sunspot number above 30. This value was arbitrarily chosen, but could not be much lower as some cycle minima had smoothed sunspot numbers around 18. Month "0" for the current minimum transit was in October 2016. 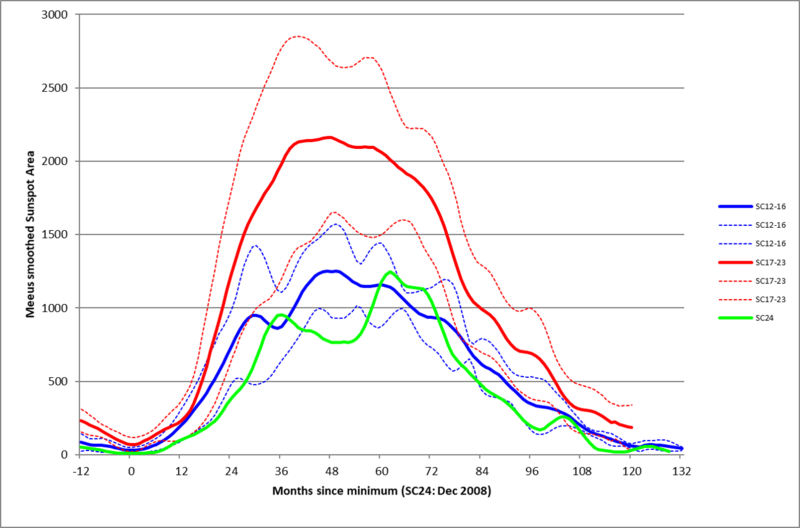 For the "red" group of solar cycles, a minimum occured on the average 13 months later. 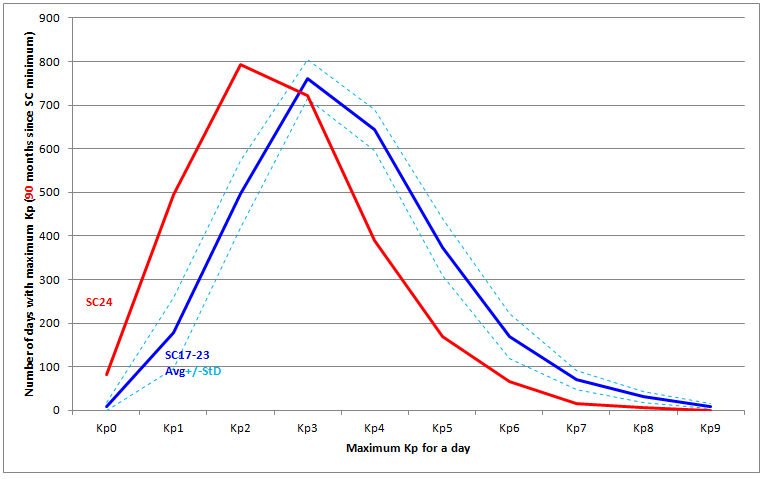 However, for the other group (blue curves) this minimum took place only after 39 months. The timing is mostly determined by the strength of the new cycle: more active cycles tend to start their rise earlier (after 8-15 months; "red" group), though there have been 2 notable exceptions: SC17 and SC22. The smoothed ISN currently still seems to be in/near the mixed zone of both solar cycle groups. This could evolve into the blue group, unless of course somewhat bigger and longer-living SC25 groups start to appear over the next few months. Graph above shows the evolution of the hemispheric sunspot number. 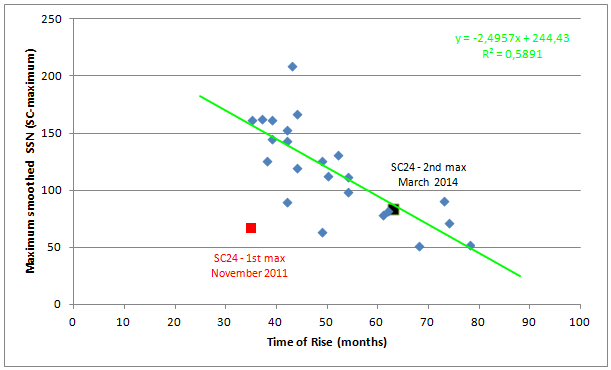 It is clear that the first SC24 maximum was due to increased activity on the northern solar hemisphere (smoothed Rn = 66,4 in November 2011), whereas the second, true, maximum was the result of enhanced activity on the southern hemisphere (smoothed Rs = 83,3 in February 2014). Sunspotgroups of SC24 are appearing at the expected latitudes. 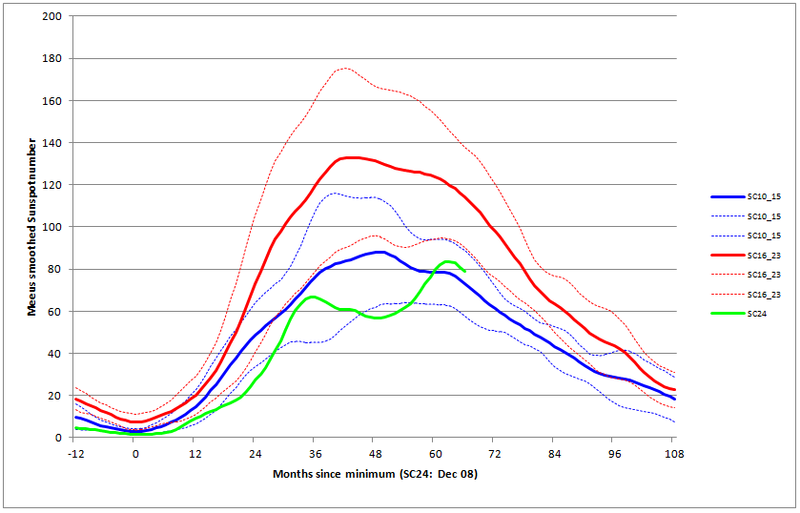 In 2012, northern sunspotgroups appeared on the average 5° closer to the solar equator than the southern ones (resp. +14,4° vs. -18,6°). In 2014, this latitude difference has shrunk to about 2,5 degrees (resp. +11,3° and -13,8°). So far for SC24, the most extreme latitude of a northern sunspotgroup was +41,6° (NOAA 1069, May 2010), whereas for the southern solar hemisphere this was -37° (NOAA 1962, January 2014). In December 2014, there was also a high latitude group on the northern hemisphere (NOAA 2236, +29,9°). In December 2016, what is possibly the first sunspot group of the new solar cycle 25 appeared in the southern hemisphere. Some caution remains justified, in view of the average latitude of the other sunspot groups, the timing of the appearance, and its position in the Butterfly-diagram. A high latitude sunspot group at S32 early January 2018. Though this seems to be the first true SC25 group, the region had a magnetic polarity similar to that of SC24 sunspots on the southern hemisphere. To be noted is that one of the first sunspot groups in SC24 also had a reversed polarity (NOAA 1003 - See my Archives). In general, about 3% of the active regions in a solar cycle have opposite polarity. See this STCE Newsitem as well as this one and this one for more info. Using sunspot latitude at SC-maximum (Graph; see also Schatten for another approach with same parameter), and taking into account uncertainties in this method as well as in the SC24-maximum prediction (83 + 18), SC24-maximum was not expected prior to February 2014. As it turns out, this was a good prediction (SC24 maximum in March 2014), though the observed latitude was lower than expected (predicted: 14,15° , observed: 13,20°). This is in contrast with the much sooner timing one might initially have concluded from other physical parameters such as e.g. Polar Magnetic Fields. The latter would also have meant an extraordinary soon maximum for such a low amplitude cycle. 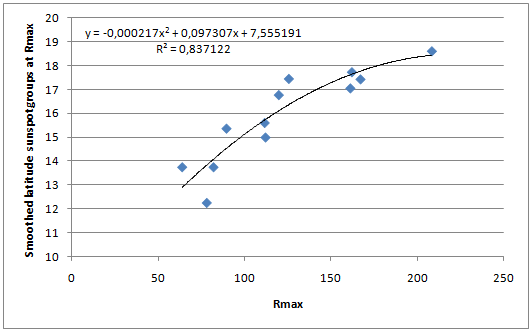 See this updated graph, showing the positions of both SC24 maxima relative to Waldmeier's curve (Trise vs. SCmax; note these are old ISN v1.0 data). It's also of interest that the overall latitude evolution happened in the lower half of the SC19-23 latitude band during the ascending and maximum phase, but that around month 60 -which coincides with the SC24 ISN first maximum- the latitude followed the general average. Just as the sunspot number, the smoothed sunspot area has reached a new maximum for this solar cycle (February 2014, 1247MH). Note the current NOAA-areas have been corrected so they can be compared to the Greenwich areas. 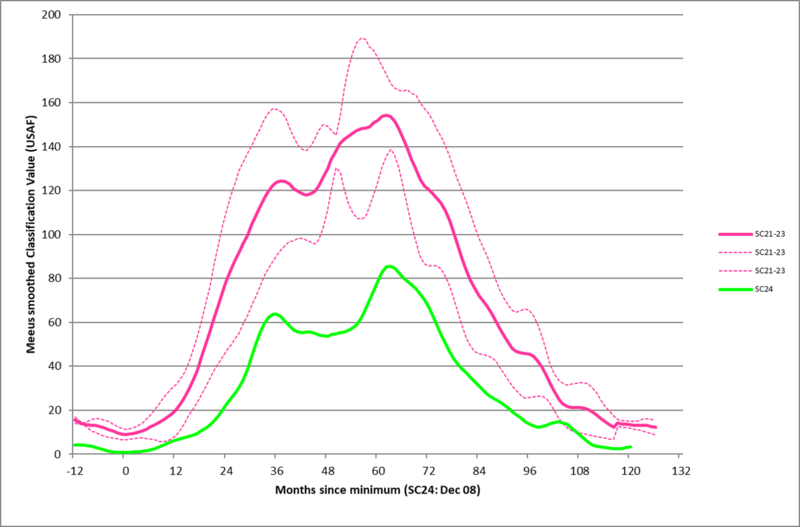 The monthly sunspot area for February 2014 was the highest so far this SC (2015 vs. 1536 MH in November 2011). The monthly sunspot area in September 2017 was only 830.7, despite the high flaring activity. From the maximum of SC18 till the maximum of SC20, the northern solar hemisphere was clearly dominating solar activity. 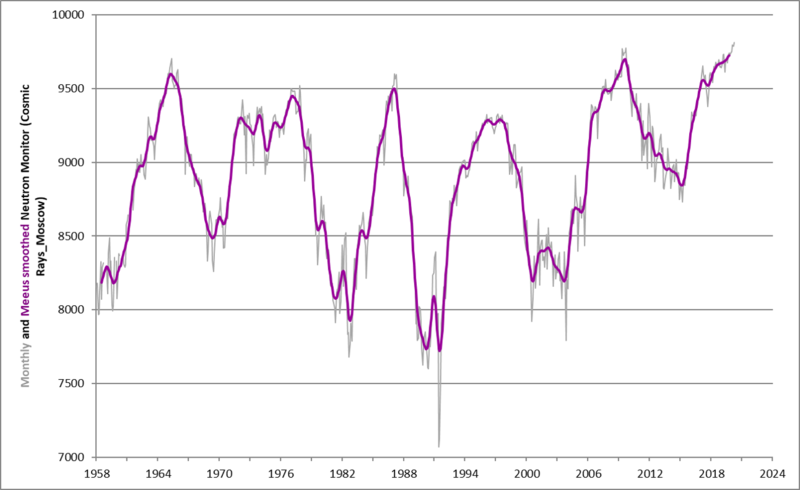 The descending branch of the last 4 solar cycles was clearly influenced by the southern hemisphere. A list with the largest sunspotgroups in SC24 can be found here (data till June 2016). For a SC-maximum of 83 (old ISN), there can appear 34 big groups (SA > 720 MH), 12 supergroups (SA > 1070 MH) and 3 giant groups (SA > 1780 MH) - See prediction chart (old ISN). 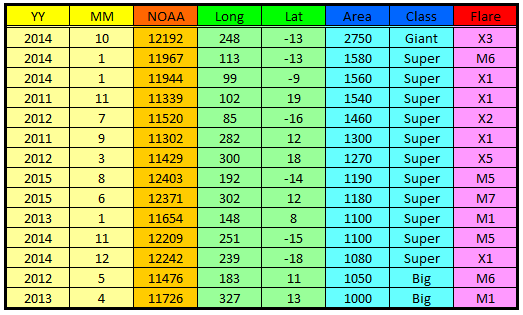 So far (January 2019), SC24 is at 25 big groups, 11 supergroups, and 1 giant group (NOAA 2192, October 2014). According to NOAA, the two largest groups in 2017 reached resp. maximum areas of 1060 MH (NOAA 2673) and 930 MH (NOAA 2674). The sunspot areas for big, super and giant groups are based on the original Greenwich data (resp. 1000, 1500 and 2500 MH), which are on the average a factor 1,4 larger than the NOAA areas (since 1976). More information on the MSFC-website. 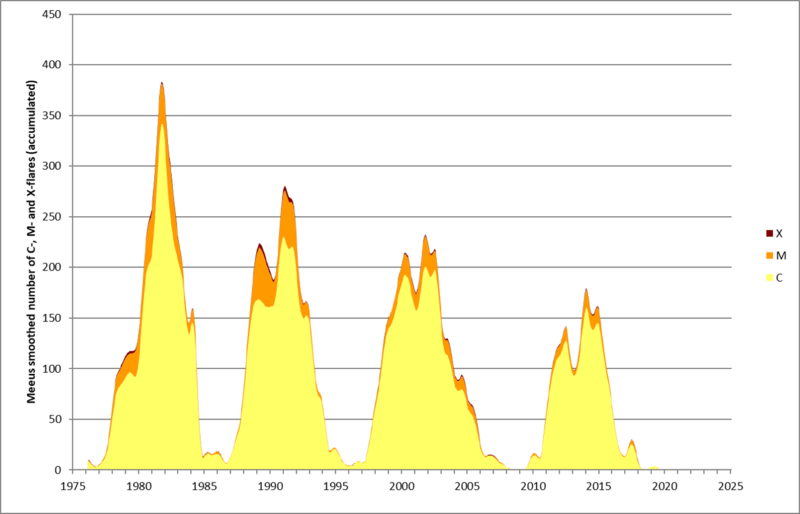 Also, the 1982-present corrections mentioned on the Solar Cycle Science webpage have been included in all graphs containing sunspot areas. 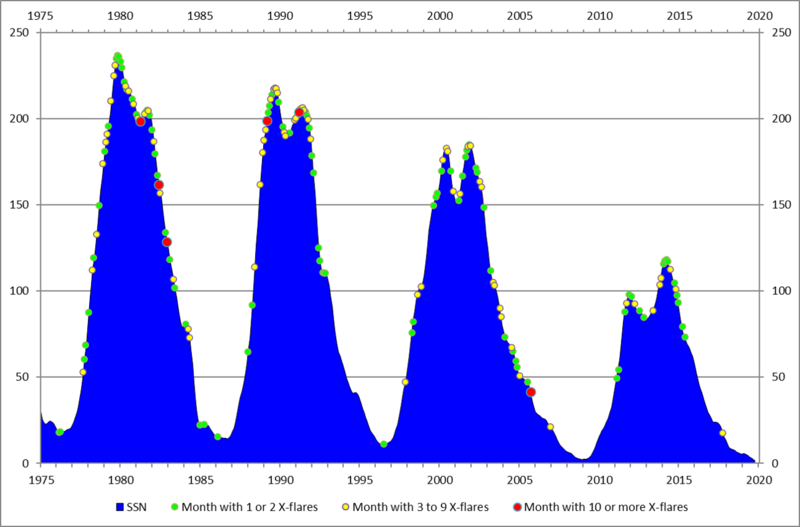 This graph compares the raw monthly Sunspot number (SIDC) with the raw monthly Sunspot Area (MSFC/NASA). Notice the large scatter: E.g. for an ISN-value of 150, sunspot area can vary between 1000 and 3000MH! The SC24-values are the green squares (January 2009 � July 2017). With 103 months in SC24 �and for as much that both parameters have been determined correctly and consistently (see e.g. 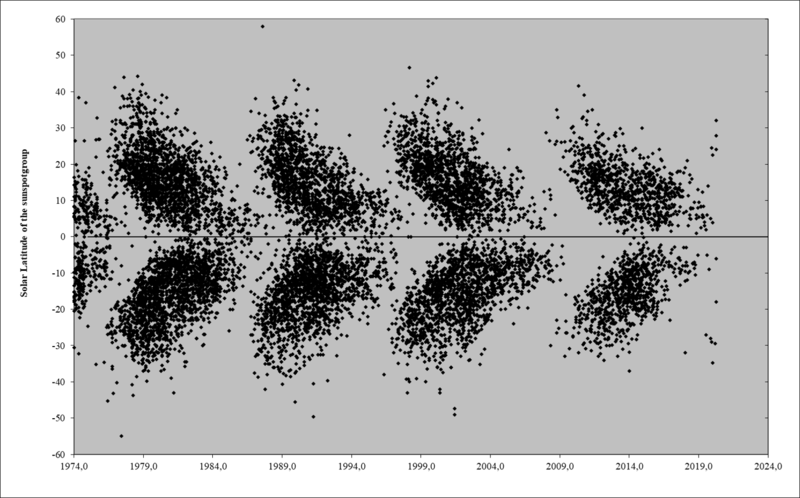 Leif Svalgaard's comments on the calibration of sunspot numbers)-, compared to complete cycles (since 1874), the ratio between sunspot area and sunspot number is about 13% less than during recent cycles, but about 3% higher than about a century ago (Avg. ratio for SC11-15: 9,51; for SC16-23: 11,02; for SC24: 9,77). 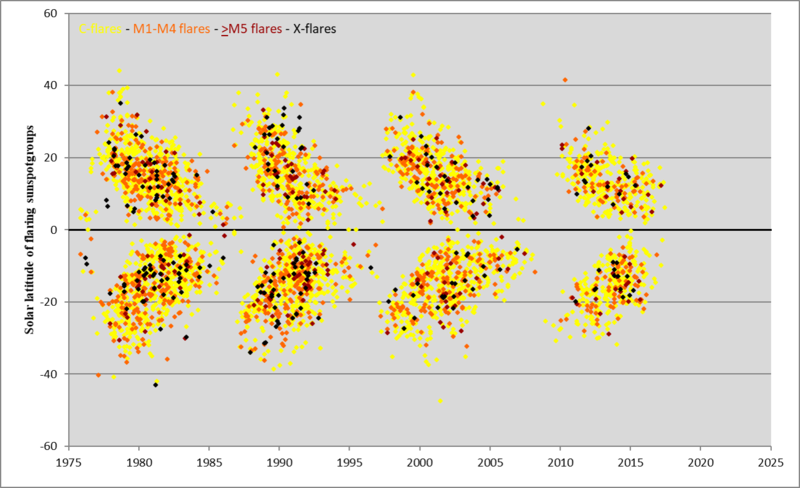 The Classification Value is a measure for flare-activity based on the outlook of the sunspot groups (P. McIntosh) and a numerical scheme devised by Kjell I. Malde in the early 1980's. The CV for SC24 remained well below the average CV (based on SC21-23 data). SC24 flare activity is well below the level of previous solar cycles. For a SC-maximum of 83 (sunspot number, v1.0), it can be expected that SC24 would produce 713 M- and 88 X-flares over its entire duration (see prediction chart). So far (31 July 2018), SC24 has produced 725 M- and only 49 X-flares. 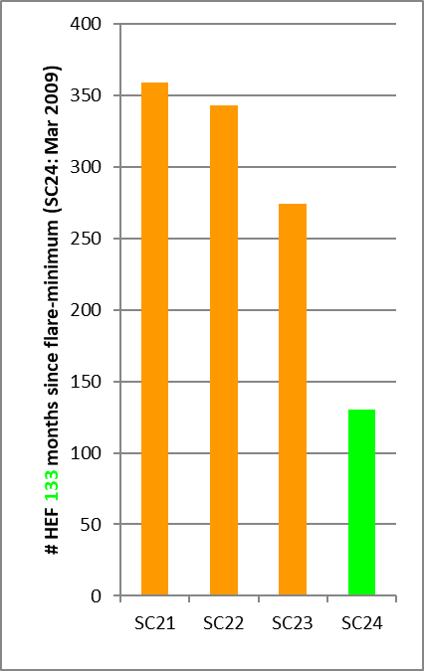 The southern hemisphere contributed to 28 of the 49 X-class flares. The 4 most recent X-class flares were produced by NOAA 2673, which also produced no less than 27 M-class flares during its transit. Note that for most of SC24, the strongest X-class flare was the X6,9 flare produced by NOAA 1263 on 9 August 2011. However, the record was broken -again by NOAA 2673- which produced an X9.3 on 6 September 2017 and another strong X8.2 on 10 September. These were the first X-class flares since 5 May 2015 (see this STCE Newsitem). Details on the first 27 X-class flares and their space weather effects can be found here. Details on the first 45 X-class flares as observed by PROBA-2 can be found in this STCE Newsitem, and more details on the flaring activity of NOAA 2673 can be found in the various STCE Newsitems (here, here, and here). A movie of the most spectacular solar eruptions during SC24 can be found at this STCE Newsitem, and a video with the most notable events of 2018 is at this STCE Newsitem. The flare fluence of an active region is taken here as the total number of C-, M-, and X-class flares it has produced multiplied by a weighting factor of resp. 1, 10 and 100. The first solar flare fluence peak in SC24 was caused by the northern hemisphere, reaching a maximum in November 2011 (512). Since mid 2013, the southern hemisphere has been determining the solar flare level, with a maximum smoothed fluence value of 585 in January and October 2014. 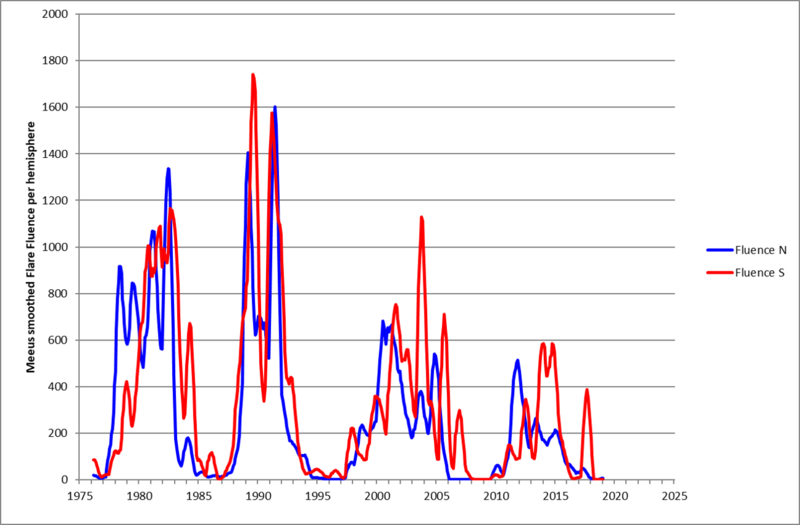 The weak flaring activity of SC24 compared to previous solar cycles stands out. The uptick at the end of the red curve is from flaring activity by NOAA 2673 in September 2017. This group produced less X-class flares than the famous October 2014 group NOAA 2192 (4 vs. 6), but they were much stronger making NOAA 2673 the most flare intense group of SC24 (total fluence resp. 2760 vs. 2032). Last 6 values of smoothed sunspot number are extrapolated. SC24 produced its first X-class flare on 15 February 2011 (see Archives). A list with SC24's Top 17 of most flare-active sunspot groups can be found here (data till July 2018). NOAA 11429, NOAA 11515, NOAA 12192, as well as NOAA 12673 belong also to the Top 50 of most flare-active groups since the measurements started in 1976 (NOAA 12673 ranks 12th, NOAA 12192 20th). October 2014 was the first month with 6 X-class flares (all from NOAA 12192) since September 2005 (NOAA 10808 with 10 X-class events). There was no X-class flare since the X2.7 event of 5 May 2015, until NOAA 2673 unleashed its flaring power in September 2017. 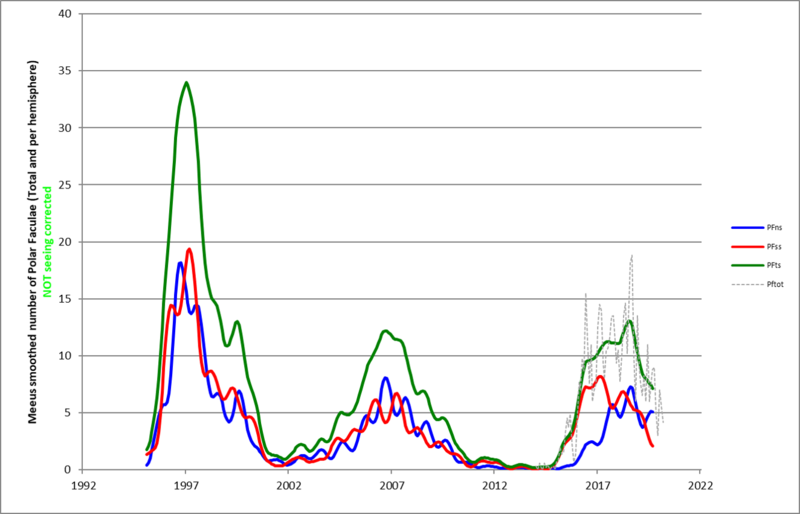 This long gap can also be seen in the graph underneath, where the yearly number of X-class flares can be seen ranked with respect of the solar cycle maximum (SC24: "0" = 2014). More info in this STCE Newsitem. The first HEF (x-ray class >M5) of SC24 was produced by NOAA 11045 (N) on 7 February 2010 (M6,4). 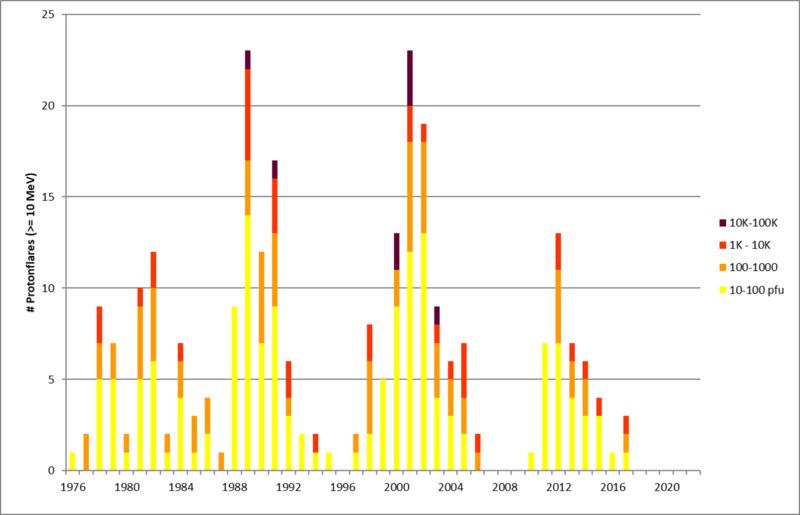 SC24 totals significantly less HEFs than the previous three solar cycles. In 2011-2012, the northern flaring groups were more numerous and powerful (black dots). In 2013-2014, the more flare active regions were on the southern solar hemisphere. The proton flare production in SC24 looks similar to SC21 in number and intensity. The source of the minor proton event in 2017 was NOAA 2665 (M2 flare on 14 July). See the STCE News item of 27 July and 19 July for more info on this flare active group. NOAA 2673 was responsible for the two other proton events in 2017, with the proton event on 10 September, associated with the X8 flare, the 4th strongest of SC24 (NOAA) and only the 2nd Ground Level Enhancement of the current SC24 (list at OULU). 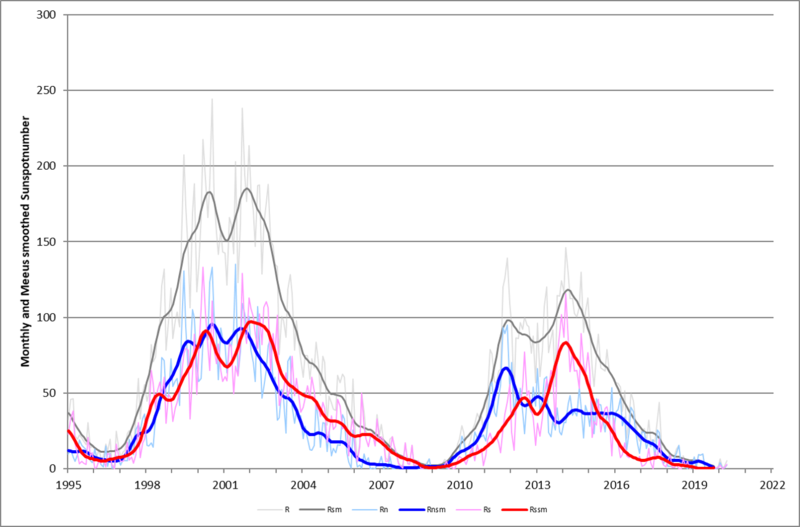 Based on the previous 2 solar cycles, the maximum number of prominences seems to precede the maximum number of CMX-flares by about 1 year (+/- 3 months). The smoothed maximum of prominences was reached in January 2013 (5,41), which now seems to precede the maximum of CMX-flares by about a year (February 2014; 179). Note the first flare maximum can not clearly be distinguished in the BAA prominence data, which seems to have only one maximum. Above charts are based on my own H-alpha observations. The top chart shows the smoothed monthly (daily average) evolution of the number of prominences per 10°-latitude band since 2006. Starting 2010, a gradual intensification and subsequently by late 2011 a splitting can be seen in both solar hemispheres. The prominences in the northern hemisphere reach the pole early 2013, whereas for the southern hemisphere this happens around mid 2014. The middle chart (percentages per 10°-bands) shows that mid 2015, there are almost no prominences anymore near the Sun's poles. 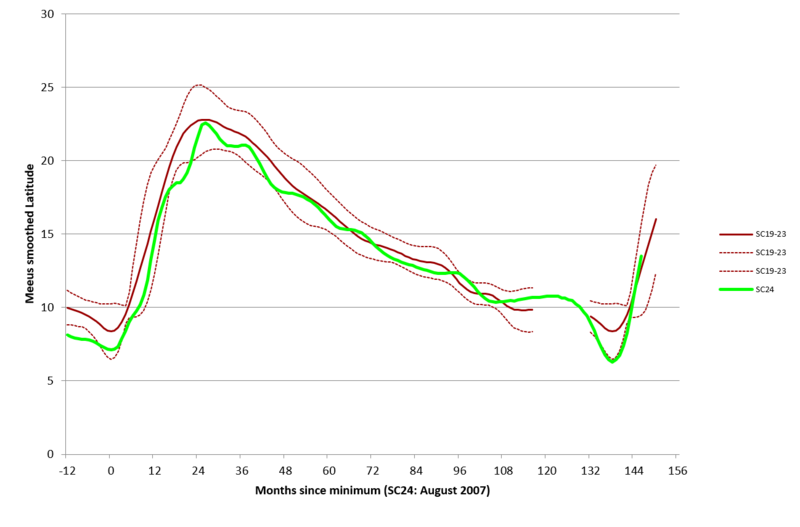 This is a clear sign that the related polar magnetic field reversal has taken place on both hemispheres. The delay between the north and south polar reversal seems to be about 1,5 years, slightly longer than during SC23. 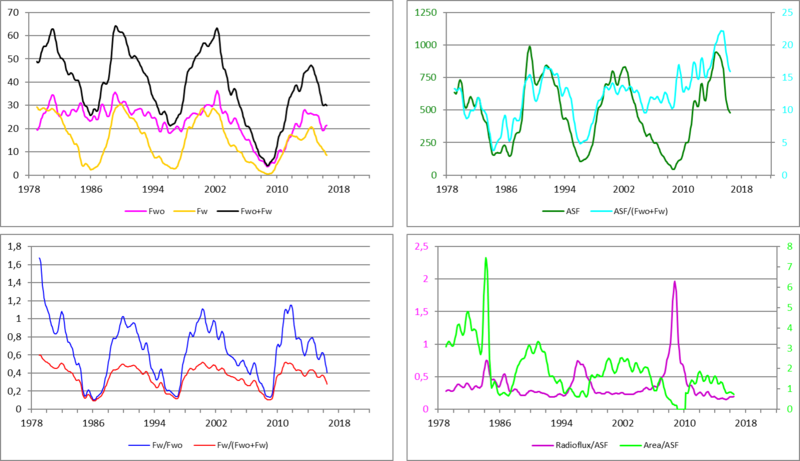 Above charts show the (Meeus smoothed) evolution of some faculae parameters as determined since 1978 by the German solar section SONNE (data till December 2016, smoothed till June 2016). Fwo and Fw are faculae fields without and with sunspots, ASF are the number of individual area shaped faculae within the faculae fields. All raw faculae data were multiplied by 10 by SONNE. "Area" is the sunspot area over the entire disk. As can be seen, except for the effects of the deep and long cycle minimum, it seems there are no obvious Livingston-Penn effects (yet). The number of faculae fields is about 20-25% below the values from the previous solar cycles. Interestingly, the ratio of facular fields with and without sunspot is near unity, and thus very similar to previous solar cycle maxima. Also the number of individual faculae is similar to previous cycles, and with the lower number of faculae fields, results in the highest ratio of faculae per faculae field since the observations started late in the 1970's (about 30% up compared to previous cycles). Note that during the early years, a relatively large number of pointlike faculae were observed, which are now essentially absent. The ratio between the sunspot area and the ASF has been gradually declining, essentially due to less and smaller sunspot groups in SC24, but also due to the the somewhat higher number of ASF in this solar cycle. Note the data in the above chart are NOT corrected for seeing. 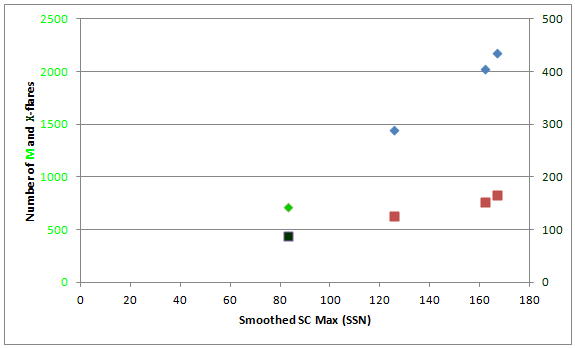 The seeing-corrected data indicated a possible SC24-maximum of 85+/-25, which turned out to be very close to the true maximum of 83,7 (ISN version 1.0). Nonetheless, the method depends heavily on the observations and on the correction for seeing and hemispheric (seasonal) visibility, so this may have been simply beginner's luck. A noticeable increase in the number of polar faculae has been observed on the southern hemisphere starting early 2015 coinciding with an increase in magnetic field strength near this solar pole (see Wilcox SO and MSFC). See also this STCE news item. This is probably the first sign of the new solar cycle 25. Of note is that in 2017, observations indicate that the number of polar faculae on the southern hemisphere has been decreasing compared to 2015 and 2016, whereas at the northern solar pole the numbers seem gradually to increase, with the two about equal early 2018. The total number of polar faculae hints at a broad maximum. Late January 2019, a prediction for the intensity of upcoming SC25 has been submitted to the international SC25 prediction panel. The method, based on seeing corrected values of polar faculae observations, predicts the maximum of SC25 to be 115 +/- 30, quite similar to SC24. The forecast indicates SC25 is likely again a double-peaked cycle but, unlike SC24, solar activity would first peak in the southern hemisphere, then in the northern one. The predicted maximum is a lower boundary, as current (2019) polar faculae numbers remain relatively high. The SC24-radioflux is now close to the low end of the SC19-23 average. 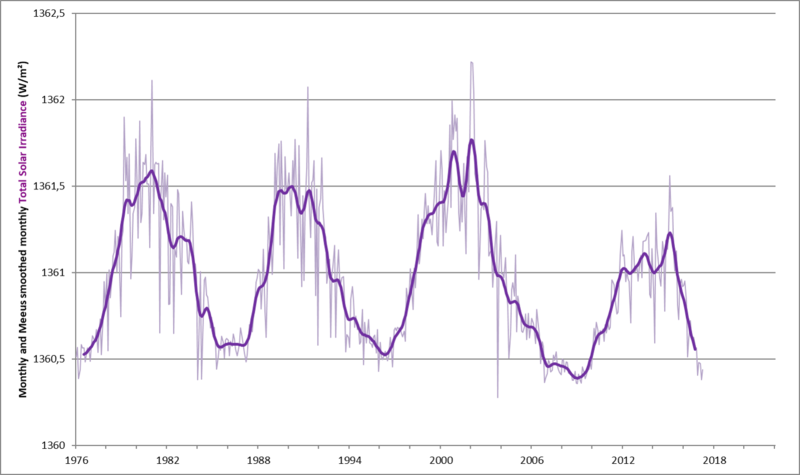 The Ap-index reached its minimum in October 2009, 10 months after sunspot minimum. 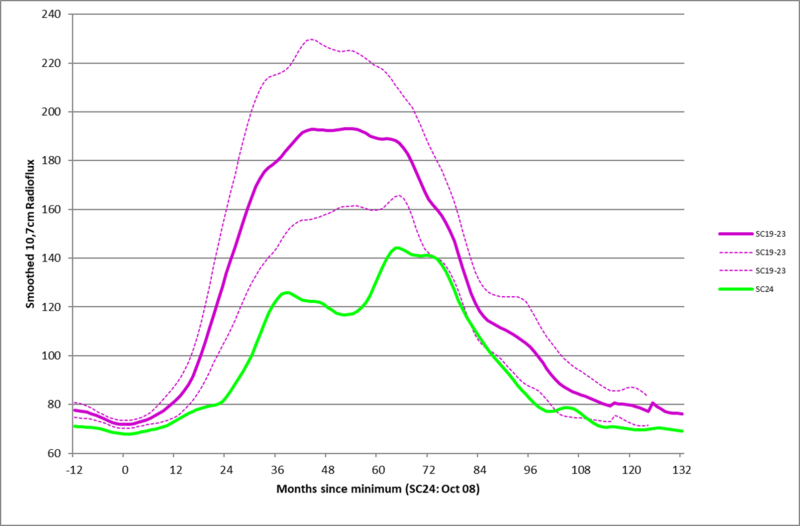 Highest monthly Ap-value so far this solar cycle was reached in September 2017 (18.1), superseding March 2015 (16,3), March 2012 (16,1) and September 2015 (15,8). 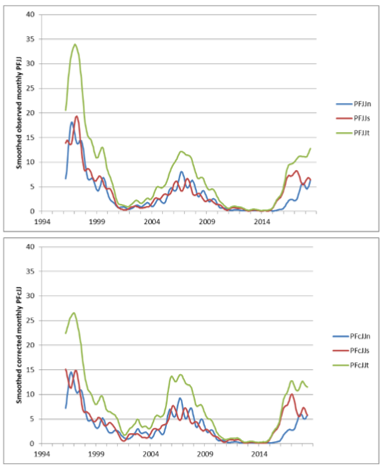 In June 2015, the smoothed Ap-value passed 10 for the very first time this solar cycle. Most of the minor geomagnetic storms in 2015 were the result from high speed streams from coronal holes. Table underneath summarizes the highest monthly Ap-value per solar cycle (since 1932). 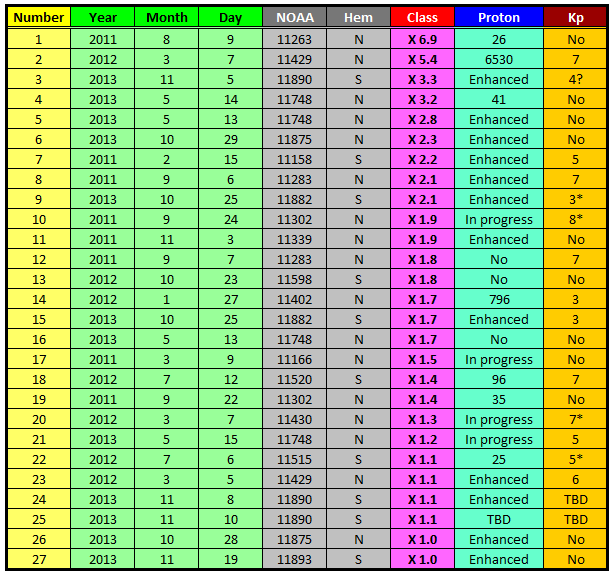 Notice how the highest values almost always happen in spring or autumn, and usually 2-4 years after SC-maximum. So far this solar cycle (January 2019), we still did not experience an extreme geomagnetic storm (Kp=9), however very intense storms (the strongest so far in SC24) took place on 17 March and 22-23 June 2015 (Dst resp. -223 and -204 nT). See also the updated graph (data till June 2016) underneath from this STCE Newsitem (26 March 2014), showing the overall weakness of the geomagnetic disturbances in SC24. This graph was added to highlight the peculiar low Ap-values during the SC23-24 minimum, which are well below previous cycle minimum values. 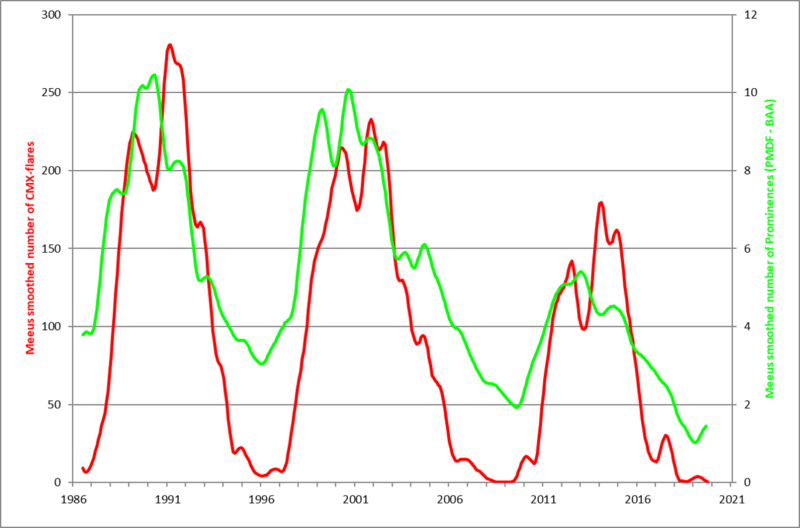 As the Ap-index, Total Solar Irradiance seems to be lower than during previous cycle minima (However, see caution note). Absolute data till June 2016 (smoothed till December 2015). Note this concerns a new scaling/correction technique (New VIRGO scale). Caution: Please note the above graph is based on composite data from various instruments gathered since the late 70's. The reduction to the final data is complex and continuously ongoing. Therefore, it is very healthy to allow for an uncertainty of at least 0,2 W/m2 in the above graph's data (h/t Leif Svalgaard). 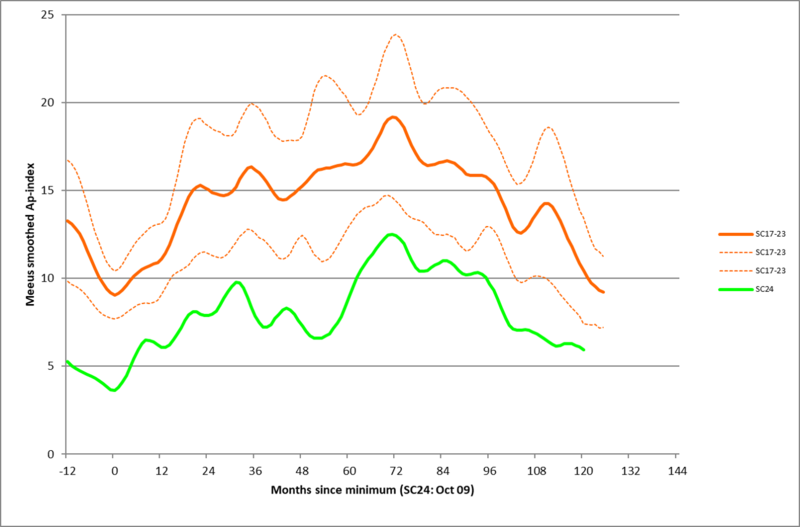 The evolution of the air pressure corrected monthly neutron count as monitored by Cosmic Rays station Moscow. 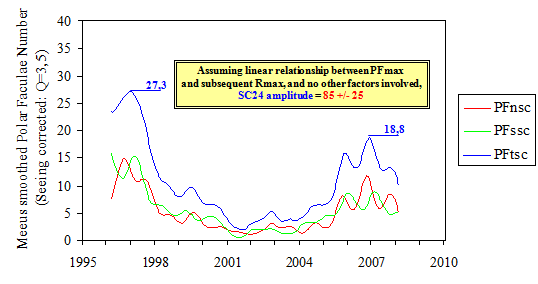 The latest cycle minimum value (corresponding to the neutron maximum value) is comparable to that prior to SC20. 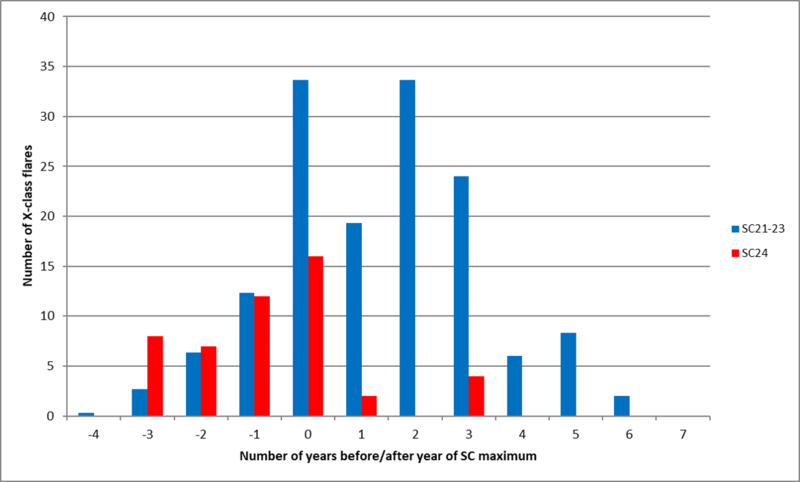 Counts during SC24 maximum were well above the SC20 maximum. Currently, neutron counts are already approaching the same level as during the SC24 minimum. More on cosmic rays in this STCE Newsitem. Sunspotnumbers - Wolfnumbers from SILSO, World Data Center for the Sunspot Index, Royal Observatory of Belgium, Brussels, 1749-present. (Data source: SILSO). 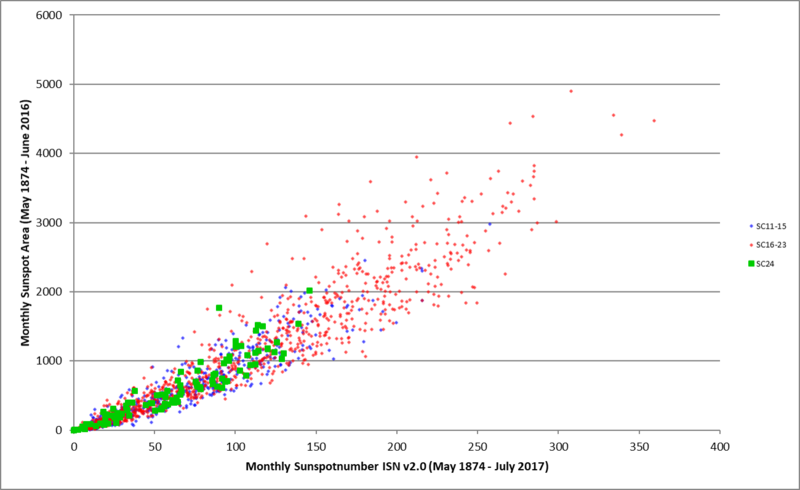 Note that, unless stated otherwise, all sunspot numbers used on this page are the version 2.0 sunspot numbers from SILSO. Sunspot areas - NASA's Marshall Space Flight Center, since 6 May 2017 maintained at the SolarCycleScience webpage. Sunspot Latitude - NASA's Marshall Space Flight Center, since 6 May 2017 maintained at the SolarCycleScience webpage. X-ray Flares - NOAA/NGDC (National Geophysical Data Center). 2011-2013 data were taken from "The Weekly". The data since July 2017 were taken from SWPC's daily events reports.